Tucked behind the magisterial Winslow Homer gallery at the Clark Museum in Williamstown, Massachusetts, sits a small quiet room of landscape paintings. One could easily walk right through it— en route to the more dazzling pleasures of the Impressionist collection in the next gallery — without focusing on its contents. But it’s worth stopping and looking. And looking again. Here hangs the work of the American painter George Inness, one of the most influential artists of the 19th century who became a follower of Emanuel Swedenborg. 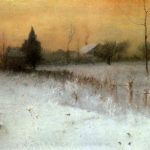 Though I was raised a Swedenborgian, I didn’t discover Inness until well into adulthood — and at first was unaware of the strong affinity that drew me to him. This collection of paintings seems lit from within, many set at dawn or twilight, and almost all of simple, pastoral scenes. But each somehow conveys a sense of mystery and anticipation. Perhaps it’s because, as scholars point out, Inness believed deeply in Swedenborg’s teaching that God is everywhere present in nature. For me, though, it’s more that Inness had a profound ability to see what’s right there — a stand of trees, a field, a young boy herding cattle along a creek — and at the same time convey what is beyond the naked eye: the thing in us that recognizes beauty. Here’s a poem along these lines by the contemporary American poet Carl Dennis. Beautiful painting and poem, Liza! And the paintings truly seem to be “lit from within”, as you said. Thanks for sharing! Happy Spring to you! Happy Spring to you, too! Though we still have about a foot of snow in the Berkshires (sigh). Thanks, Cheryl! Any signs of spring in Maine? Thanks so much for this You Tube link, Leslie! 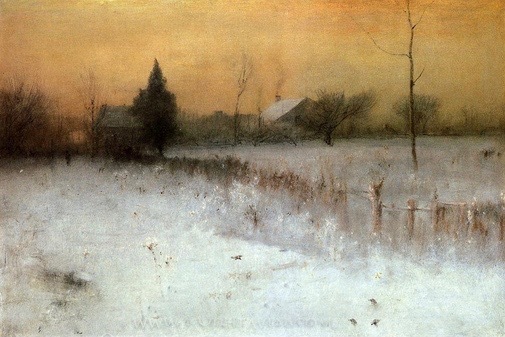 And your quote from Inness’ son — confirming everything I feel when I look at his work. Hope all goes well with you! I love this painting by Innes. It is luminous. And I like Carl Dennis very much. Thanks for bringing them to us. Thanks, Patty. I’ve really just stumbled upon Carl Dennis — what a delightful discovery. Liza, what a beautiful read! And what a pleasant surprise to run into a herd of Gyllenhaals galloping across the landscape of our little hometown. I hope your visit was pleasant. And a belated happy birthday to Bill. I got a preview of the cake! That, too, was a work of art, full of meaning and imagery, in any light! Thanks, Jenny! What a lovely surprise to run into you last weekend. We had a wonderful time — who couldn’t with that cake and my family in the picture? Good to see your family, too. It’s been almost ten years since my mother passed away — how she loved your grandson!